Secure LoopsTM are a new product designed to facilitate quicker and easier wheelchair transportation securement. US Patent #5,391, 030. Made in the USA. CREATE A SAFE AND VISIBLE ATTACHMENT POINT ON WHEELCHAIRS. "Safe Haven Secure Loops" are securely attached to the wheelchair. Their patented design prevents them from falling off. When properly installed, they aid public transportation personnel in locating the appropriate attachment point. Secure Loops meet the requirements of SAE J2249 which includes a frontal impact test conducted at 30 mph, 20g using a forward facing surrogate wheelchair with a mass of 85kg and an ATD with a mass of 76.3 kg. Secure Loops are sold in the sets of 4-each. Standard lengths are 11", 13", 15" and 21". 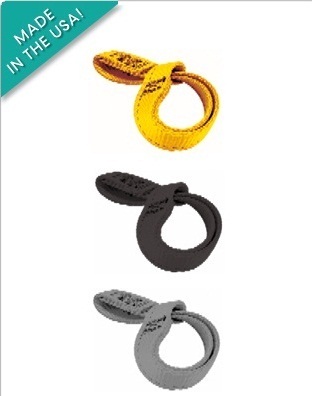 Specify color when ordering: Yellow, Black or Gray. Secure loops are the best way to add a permanent attachment point to your wheelchair. The patented designs enables easy installation and prevents them from falling off or being easily removed.